I love a good dinner recipe that is easy to make during a busy weeknight. This Rabbit and Vegetable Bake fits perfectly for that. My other favorite dinner meals are Instant Pot Spaghetti Sauce and Instant Pot Tuscan Chicken. Rabbit meat is more common in Eastern Europe, since I moved to the states I found it very difficult to find it. This rabbit and vegetable bake is a traditional meal in our family and I wanted very much to recreate it for my husband. Finally the Whole Foods near us started carrying rabbit meat, and I couldn’t wait to get some. This rabbit and vegetable bake is truly great. I learned the recipe from my mom and its the only way I cook rabbit. It turns out delicious all the time. Also, the rabbit meat gets very soft and tender. The bake is done in layers of sautéed veggies and browned rabbit. 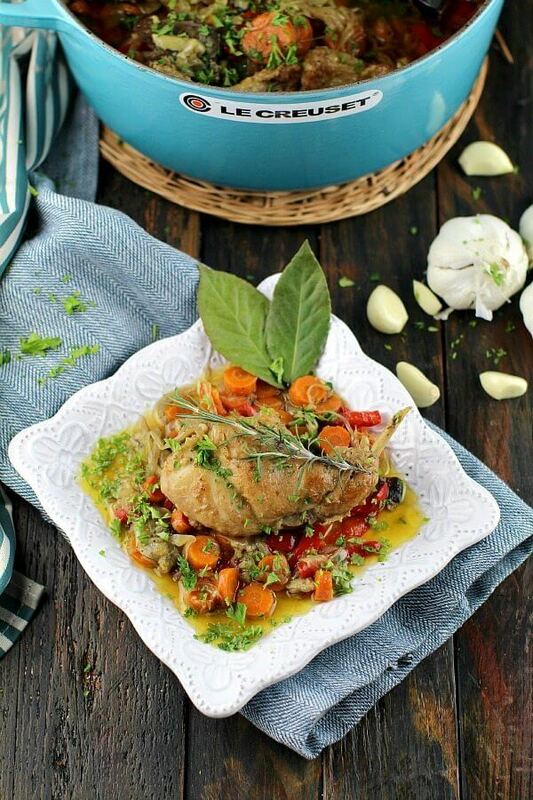 This way the rabbit meat gets a chance to absorb the juices from the vegetables by being baked into that flavorful natural veggie sauce. The secret to very tender rabbit meat is to keep the raw meat in cold water for 24 hours or at least for 12. This will make such a huge difference in the texture of the rabbit. In addition, I always add a lot of minced garlic to the rabbit and vegetable bake for some extra savory flavor. 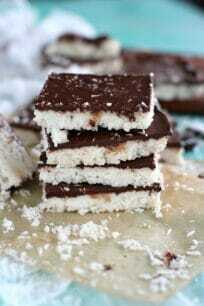 Firstly, it’s very easy to make, with minimum ingredients and dishes to clean. Also, a hearty and delicious meal, that looks good to be served on weekends, or for a special dinner occasion. In addition, the meal is packed with protein. Healthier alternative to pork or beef meat, because rabbit is a much leaner meat. Can I substitute lamb for rabbit? Yes. Lamb is a great alternative for rabbit in many recipes including this one. If you are going to use lamb, I would recommend using lamb chops. The cooking time for lamb might also vary a bit. 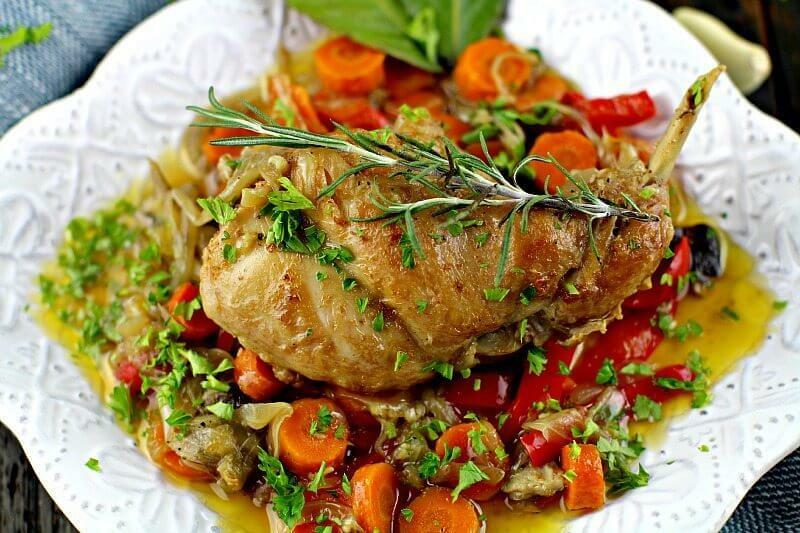 WHAT WINES PAIR WELL WITH Rabbit and Vegetable bake? 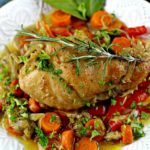 A nice, fruity red wine such as Zinfandel or Syrah will pair nicely with the flavors in this rabbit dish. Can you freeze Rabbit and Vegetable bake? Yes. First, let the sauce cool completely before freezing. Then, transfer into freezer-safe containers or heavy-duty freezer bags and add the rabbit. Label with the date, and freeze for up to 3-4 months, or longer if you use a deep freezer. 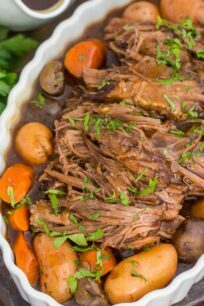 For this recipe you need a 10 quart baking dish or preferably a dutch oven, best results will be achieved when using a dutch oven. One day before, rinse well the rabbit meat under cold water, place the cut up rabbit in a large pot and cover with cold water. Place it in the fridge. In the morning, discard the water, rinse the rabbit and refill the pot with cold water again, add the rabbit and let it sit in the water until ready to start dinner. Preferably the meat must stay in the water for 24 hours, or a minimum of 12 hours. Prepare your working station by covering a part of your counter in paper towels, remove the cut up rabbit pieces from the water and place on paper towels to drain. Cover in paper towels as well, we need the rabbit dry. If needed replace the paper towels with dry ones, to absorb the remaining excess of water. Let the rabbit sit covered in paper towels for 30 minutes. Discard the paper towels, and once the rabbit is dry transfer it to a large pot. In the meantime, while the rabbit is being drained of excess water, start on the veggie sauté. Add 1/2 cup of oil to a large skillet over medium heat, when the oil is hot add the sliced onions and cook for 7 minutes, until the onions start to look translucent and golden, add the chopped carrots, cook for another 8-10 minutes, stirring as needed. Add the chopped bell pepper, the minced garlic and mushrooms, plus salt and pepper as needed. Cook for another 5-7 minutes and turn off the heat. Mix 3 tablespoons of salt, 3 tablespoons of pepper and 3 tablespoons of flour and add them to the rabbit, shake and mix well, for the rabbit to be covered in the flour, salt pepper mix. Place a large skillet over medium - high heat and add 1/2 cup of canola oil, when the oil is hot add the rabbit pieces in one layer to the skillet and cook on each side for 5-7 minutes, until golden brown. Transfer to a dish and repeat with the rest of the rabbit. Add oil to the skillet as needed. Once the rabbit has been browned and the veggies sautéed preheat oven to 350F. Now you have to layer the rabbit bake in the dutch oven. First bottom layer is a layer of browned rabbit meat, top with a layer of sautéed veggies, 5 garlic cloves and 5 bay leaves. Another layer of rabbit, veggies, 5 garlic cloves and 5 bay leaves. 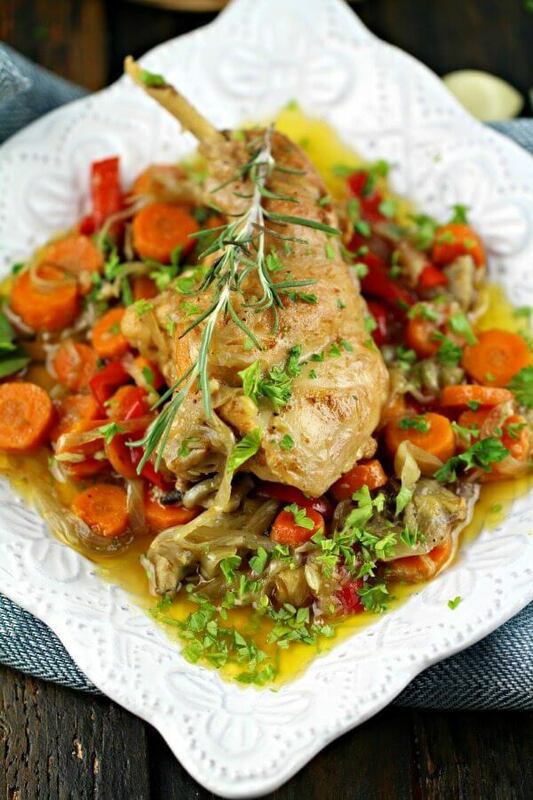 Pour 1 cup of wine into the dutch oven over the rabbit and veggies, and 3 cups of water. Now, make sure the bake is not covered in liquid, only use water as much as needed, the water should stay 1 inch down from the top layer. Place 3 rosemary strings on top, cover with the lid and transfer to the heated oven. Bake for 1 hour and 20 minutes. Remove from oven, discard the rosemary strings, decorate with fresh chopped herbs, and the remaining fresh rosemary strings. 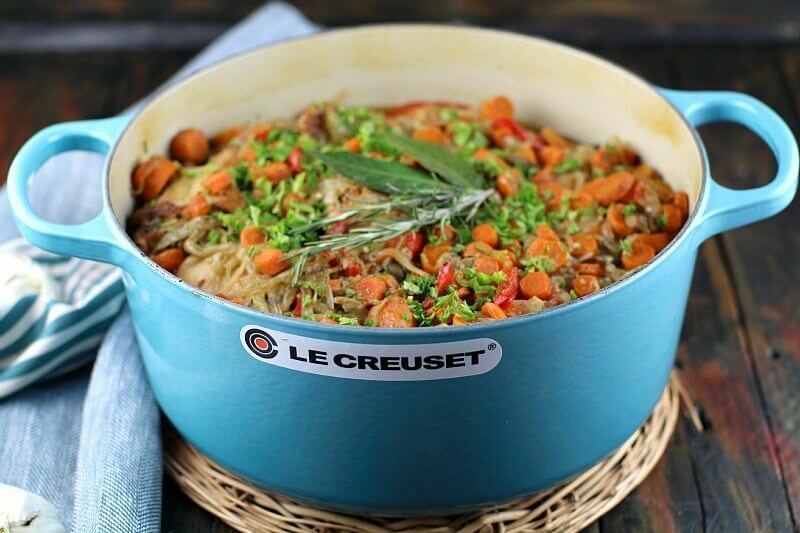 That Le Creuset dish is my favorite, so in love with it!